The Tacoma Musical Playhouse saw a crowded lobby and a full house on the opening night of “My Way: A Musical Tribute to Frank Sinatra.” Complete with themed cocktails, the ambiance of the theater recalled a classy evening of jazz in 1960’s Chicago or New York. The show is oodles of toe-tapping fun. 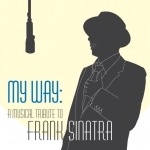 The cast and direction perfectly pair tongue-in-cheek cheese with the genuine emotion of Sinatra’s music, and the music is accompanied by fun dancing and easy banter between the eight singers. Unfortunately, the space and the sound system didn’t do the singers any favors. It’s an ambitious undertaking to seamlessly blend soloists who all have their own microphones, and the single direction speakers did very little to carry their sound through the theater. Most singers and directors worth their salt know that two voices singing unison is one of the toughest feats to master, and yet this production called for exactly that on multiple occasions, forcing the performers into long, musically challenging phrases where every tiny slip stuck out like a sore thumb. As a born-and-raised choir nerd, I judge these types of mistakes more harshly than most, but the audience at large could hear them as well. The set was fabulous yet simply, a 40’s style bar/restaurant that added a dynamic element to the numerous medleys, but the onstage success was not mirrored by the lighting production. The mood lighting was simplistic, the spotlight cues were slow and missed the performers on more than one occasion, and there was an entire medley where the spotlight hit only the top of the actors’ heads, making them look more like they should be telling a ghost story at summer camp than performing a heartfelt song about Frank Sinatra’s internal struggles. That said, one of the production’s definite strengths was the care they took in acknowledging all parts of Sinatra’s life in a (pardon the pun) frank and honest manner. Between the medleys, actors took turns telling anecdotes about Sinatra’s life, both well-known and obscure, creating a three-dimensional portrait of the departed legend.